The Indian Space Research Organisation (ISRO) is developing systems to forecast natural disasters, using satellite-derived information, that could be used as input by disaster management agencies and the state governments. Cyclone formation, track and Intensity: This system would be used for forecasting cyclone formation, tracking their path and intensity. The methodology developed has been transferred to India meteorological Department (IMD), which handles cyclone forecasts. Flood Early Warning System (FLEW): The North Eastern Space Applications Centre (NESAC) of ISRO has developed the Flood Early Warning System (FLEWS) as a Research & Development (R&D) project in state of Assam, in association with the Assam State Disaster Management Authority (ASDMA). The FLEWS model is already being used in all 25 flood prone districts of Assam. 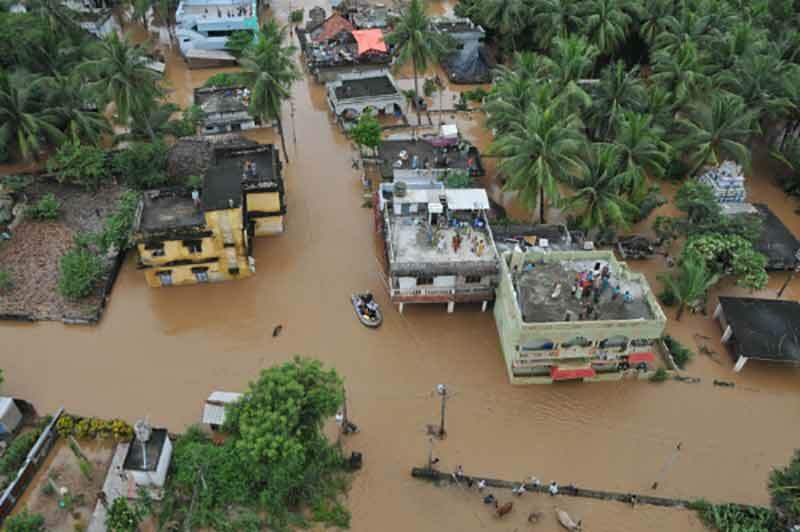 Another model for forecasting floods in the Godavari floodplains in Andhra Pradesh has been developed by National Remote Sensing Centre (NRSC) of ISRO. The methodology is being used by Central Water Commission (CWC). ISRO is developing similar systems for Krishna, Brahmani-Baitarani, Ghagra, Gandak, and Kosi rivers. Heavy Rainfall/ cloud burst alerts: The Space Applications Centre (SAC; it focuses on the design of space-borne instruments for ISRO missions and development and operationalisation of applications of space technology for societal benefits ) of ISRO has developed a model for heavy rainfall / cloud burst alerts. The information is made available on ISRO’s Meteorological & Oceanographic Satellite Data Archival Centre (MOSDAC) website. Rainfall triggered landslide alerts for the Uttarakhand Region: An experimental early warning system for rainfall triggered landslides is developed for use along the route corridors leading to the pilgrimage sites of Gangotri, Badrinath and Kedarnath (hundreds of thousands of pilgrims travel along these routes each year), as well as along the Pithoragarh-Malpa route in Uttarakhand. Landslide warnings are generated based on the statistical relation between the terrain (geological, morphological) and temporal (primarily long term rainfall events) factors. Extreme weather events: ISRO has developed experimental methodologies for early warning of extreme weather events, such as heat waves, using numerical weather predictions. This information derived is also being made available on the MOSDAC website. ISRO also two satellite missions, namely MeghaTropiques (launched in Oct 2011) and SARAL (launched in Feb 2013), in collaboration with French National Space Agency (CNES). SARAL performs altimetric measurements designed to study ocean circulation and sea surface elevation, while the MeghaTropiques mission is delivering a dynamic three-dimensional picture of different states of water in the atmosphere. The position of the satellite over the inter-tropical belt, in a low-inclination orbit enables up to five revisits to the same location every day, allowing it to achieve remarkable progress in estimating rainfall and forecasting cyclones, monsoons and droughts. In October 2016, a 4-year extension was signed for the project. Currently, ISRO is working with National Aeronautics and Space Administration (NASA) from the USA on a joint satellite mission, ‘NASA-ISRO Synthetic Aperture Radar (NISAR), to be launched by 2020-21. Synthetic Aperture Radar (SAR) refers to a technique for producing fine resolution images from an intrinsically resolution-limited radar system. The satellite is designed to observe and take measurements of some of the planet&apos;s most complex processes, including ecosystem disturbances, ice-sheet collapse, and natural hazards such as earthquakes, tsunamis, volcanoes and landslides. Data collected from NISAR will reveal information about the evolution and state of Earth&apos;s crust, help scientists better understand our planet&apos;s processes and changing climate, and aid future resource and hazard management. The fund allocation for MeghaTropiques is INR 816 million (~USD 12.6 million), for SARAL is INR 738 million (USD 11 million) and INR 5.1 billion (USD 78 million) for NISAR.